The NavigationPage class provides a hierarchical navigation experience where the user is able to navigate through pages, forwards and backwards, as desired. The class implements navigation as a last-in, first-out (LIFO) stack of Page objects. 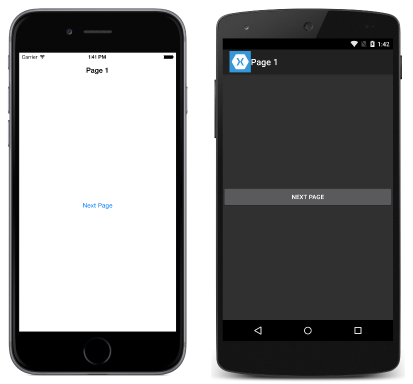 This article demonstrates how to use the NavigationPage class to perform navigation in a stack of pages. Navigation methods are exposed by the Navigation property on any Page derived types. These methods provide the ability to push pages onto the navigation stack, to pop pages from the navigation stack, and to perform stack manipulation. On iOS, a navigation bar is present at the top of the page that displays a title, and that has a Back button that returns to the previous page. On Android, a navigation bar is present at the top of the page that displays a title, an icon, and a Back button that returns to the previous page. The icon is defined in the [Activity] attribute that decorates the MainActivity class in the Android platform-specific project. On the Universal Windows Platform, a navigation bar is present at the top of the page that displays a title. On all the platforms, the value of the Page.Title property will be displayed as the page title. It's recommended that a NavigationPage should be populated with ContentPage instances only. The RootPage property of a NavigationPage instance provides access to the first page in the navigation stack. The page calling PushAsync has its OnDisappearing override invoked. The page being navigated to has its OnAppearing override invoked. However, the precise order in which these events occur is platform dependent. For more information, see Chapter 24 of Charles Petzold's Xamarin.Forms book. Calls to the OnDisappearing and OnAppearing overrides cannot be treated as guaranteed indications of page navigation. For example, on iOS, the OnDisappearing override is called on the active page when the application terminates. The active page can be popped from the navigation stack by pressing the Back button on the device, regardless of whether this is a physical button on the device or an on-screen button. The page calling PopAsync has its OnDisappearing override invoked. The page being returned to has its OnAppearing override invoked. However, the precise order in which these events occur is platform dependent. For more information see Chapter 24 of Charles Petzold's Xamarin.Forms book. This method pops all but the root Page off the navigation stack, therefore making the root page of the application the active page. Setting the boolean parameter to false disables the page-transition animation, while setting the parameter to true enables the page-transition animation, provided that it is supported by the underlying platform. However, the push and pop methods that lack this parameter enable the animation by default. Sometimes it's necessary for a page to pass data to another page during navigation. Two techniques for accomplishing this are passing data through a page constructor, and by setting the new page's BindingContext to the data. Each will now be discussed in turn. This code creates a MainPage instance, passing in the current date and time in ISO8601 format, which is wrapped in a NavigationPage instance. This code sets the BindingContext of the SecondPage instance to the Contact instance, and then navigates to the SecondPage. For more information about data binding, see Data Binding Basics. The Navigation property exposes a NavigationStack property from which the pages in the navigation stack can be obtained. While Xamarin.Forms maintains access to the navigation stack, the Navigation property provides the InsertPageBefore and RemovePage methods for manipulating the stack by inserting pages or removing them. Provided that the user's credentials are correct, the MainPage instance is inserted into the navigation stack before the current page. The PopAsync method then removes the current page from the navigation stack, with the MainPage instance becoming the active page. Any Xamarin.Forms View can be displayed in the navigation bar of a NavigationPage. This is accomplished by setting the NavigationPage.TitleView attached property to a View. This attached property can be set on any Page, and when the Page is pushed onto a NavigationPage, the NavigationPage will respect the value of the property. Many views won't appear in the navigation bar unless the size of the view is specified with the WidthRequest and HeightRequest properties. Alternatively, the view can be wrapped in a StackLayout with the HorizontalOptions and VerticalOptions properties set to appropriate values. Note that, because the Layout class derives from the View class, the TitleView attached property can be set to display a layout class that contains multiple views. On iOS and the Universal Windows Platform (UWP), the height of the navigation bar can't be changed, and so clipping will occur if the view displayed in the navigation bar is larger than the default size of the navigation bar. However, on Android, the height of the navigation bar can be changed by setting the NavigationPage.BarHeight bindable property to a double representing the new height. For more information, see Setting the Navigation Bar Height on a NavigationPage. Alternatively, an extended navigation bar can be suggested by placing some of the content in the navigation bar, and some in a view at the top of the page content that you color match to the navigation bar. In addition, on iOS the separator line and shadow that's at the bottom of the navigation bar can be removed by setting the NavigationPage.HideNavigationBarSeparator bindable property to true. For more information, see Hiding the Navigation Bar Separator on a NavigationPage. The BackButtonTitle, Title, TitleIcon, and TitleView properties can all define values that occupy space on the navigation bar. While the navigation bar size varies by platform and screen size, setting all of these properties will result in conflicts due to the limited space available. Instead of attempting to use a combination of these properties, you may find that you can better achieve your desired navigation bar design by only setting the TitleView property. On iOS, views placed in the navigation bar of a NavigationPage appear in a different position depending on whether large titles are enabled. For more information about enabling large titles, see Displaying Large Titles. On Android, placing views in the navigation bar of a NavigationPage can only be accomplished in apps that use app-compat. It's not recommended to place large and complex views, such as ListView and TableView, in the navigation bar of a NavigationPage.